Despite the late start to the wildfire season, last year’s record is being surpassed. In BC there are currently more fires burning than in any one day in 2017; in California the largest wildfire in history is still growing; and in Portugal and Spain “forest fires continue to rage”. 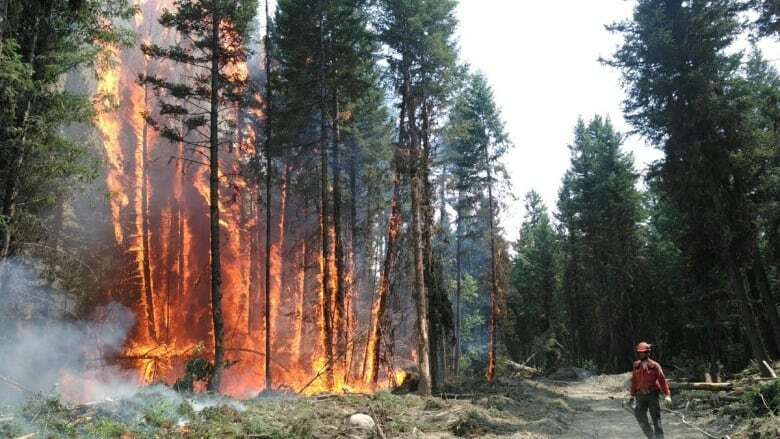 In related news: Ontario just increased its forest fire budget as lighting caused fires become the new normal, there’s lots of concern in BC with lightning in the forecast; and Island Timberlands decides it’s time to close their forests to the public. In other forest fire news: a Canadian physicians group says we need to wake up and smell the smoke; the Washington Post says breathing is a chore; the USFS is salvaging burnt timber; and amongst US politicians, Romney wants more logging while Daines seeks to ramp up forest restoration. 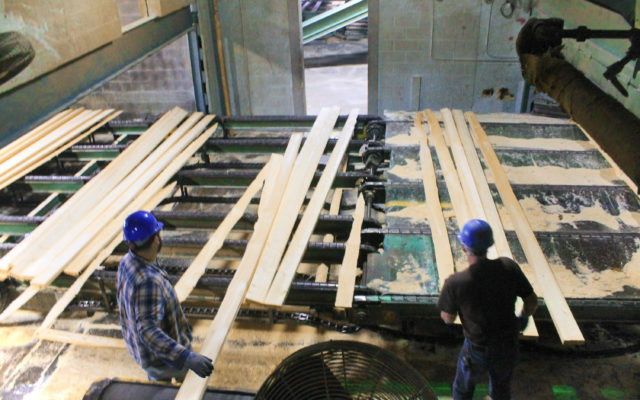 Finally, Norpac says its critics are exaggerating the impact of newsprint tariffs; and Oregon is the first state to adopt codes allowing tall timber buildings. Don’t forget – the Tree Frog News will publish on Monday only next week. A Washington State newsprint mill that sparked a cross-border trade battle has fired back at Canadian paper producers, saying they are exaggerating the impact of U.S. tariffs. …Norpac, in a filing to the ITC last week, slams Canadian producers. “They have made dire predictions of the ruin of small town and rural newspapers, with the heaviest negative impact on the elderly, when the record demonstrates that the economic impact of duties will be very small,” Norpac argues. “Newspapers have been able to increase their subscription prices significantly over time, independent of changes in standard newsprint prices/costs.”The ITC is slated to vote on Aug. 29 on whether to uphold its finding last year that the U.S. groundwood industry is being injured by Canadian imports. A Northern B.C. training program geared toward First Nations youth is looking for a few more recruits. The First Nations Youth Training Program in Quesnel gives youth hands-on work experience on projects that serve as a pathway toward employment in the natural resource and hospitality industries. …Through the program, students are trained in everything from occupational first aid to traffic control, forklift operations to resume writing and job interviewing. …The program is a partnership between Quesnel Employment Services and Blue Collar Silviculture, and is funded by the province. Program supporters and sponsors include West Fraser Mllls, Tolko Industries, Fountain Tire, Silva Gro Nursery, Barkerville Gold Mine, BV Electric, and Summit Camps. ASHLAND, Maine — With lumber mills and other businesses in the Ashland area desperate for employees, a new training program starting this fall will help lower-income workers gain new skills to work in those in-demand jobs. The Maine Community Development Block Grant program awarded the town of Ashland a $50,000 public service grant to cover tuition and other costs for low- and moderate-income workers who enroll in professional or trade courses and agree to work at area businesses. Lumber mills such as Maibec in Masardis and J.D. Irving in Nashville Plantation have an ongoing need for workers skilled in welding, electrical systems and boiler operations. …With a skilled workforce entering into retirement age, companies in northern Maine are trying to ensure there is a strong workforce for the coming decades. Toronto’s current building boom has been realized largely with reinforced concrete as the building medium of choice. Some architects, developers, and academics, however, have been pushing for more sustainable building methods. In response, in 2015 the provincial government amended the Ontario Building Code to allow wood-frame structures as tall as six storeys. 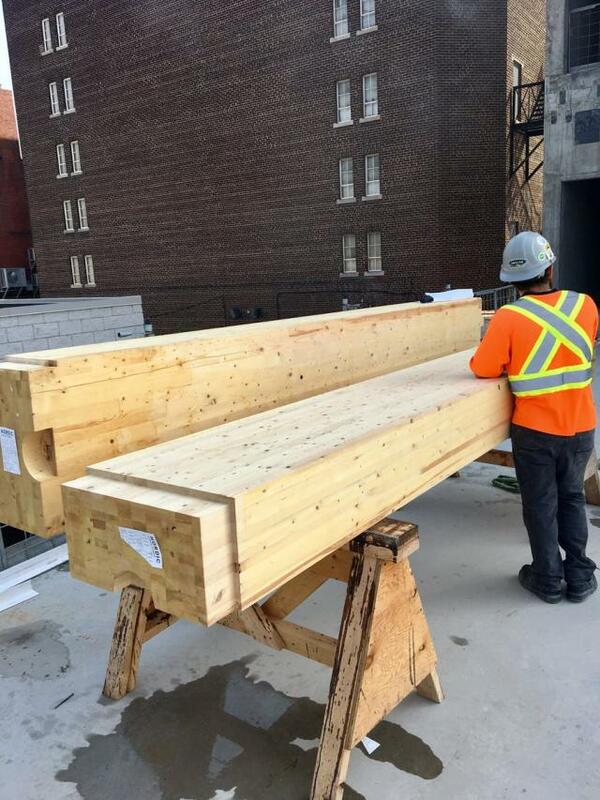 …two projects in Toronto are now well under construction using cross-laminated timber (CLT) …that greatly reduce the carbon footprint of buildings. 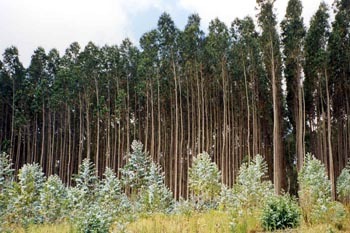 Timber sequesters carbon and promotes the harvesting of a renewable resource. The engineered CLT members are incredibly strong, and fire resistant. In Liberty Village, construction is in full swing on 80 Atlantic Avenue, a five-storey, Quadrangle-designed office development from Hullmark. …In Bloor Yorkville, a three-storey project is being built with a CLT structural system at 728 Yonge Street, and is further along. SALEM, Ore. – The State of Oregon Building Codes Structures Board recently approved and the Oregon Building Codes Division adopted code language providing for taller wood building construction in Oregon. …Oregon is the first state to take such a step at the state level, providing an assurance that if state standards are met, local governments will recognize these taller buildings. National building code committees are not expected to recognize taller wood construction until 2021, but BCD has been working with manufacturers, designers, contractors, fire officials, local building officials, testing labs and universities to ensure these new provisions meet fire, life safety and seismic standards. …Oregon’s approach recognizes a composite design incorporating steel, concrete, or masonry building components and wood members for a first-of-its-kind approach, the agency said in a news release Wednesday. CHARLESTON — Developers of a proposed Greenbrier County barrel factory say they are dotting the I’s and crossing the T’s on their financial documents and plan to announce construction plans soon. “We’re inching slowly toward the finish line,” West Virginia Great Barrel Company co-founder Tom Crabtree said. In October 2017, Gov. 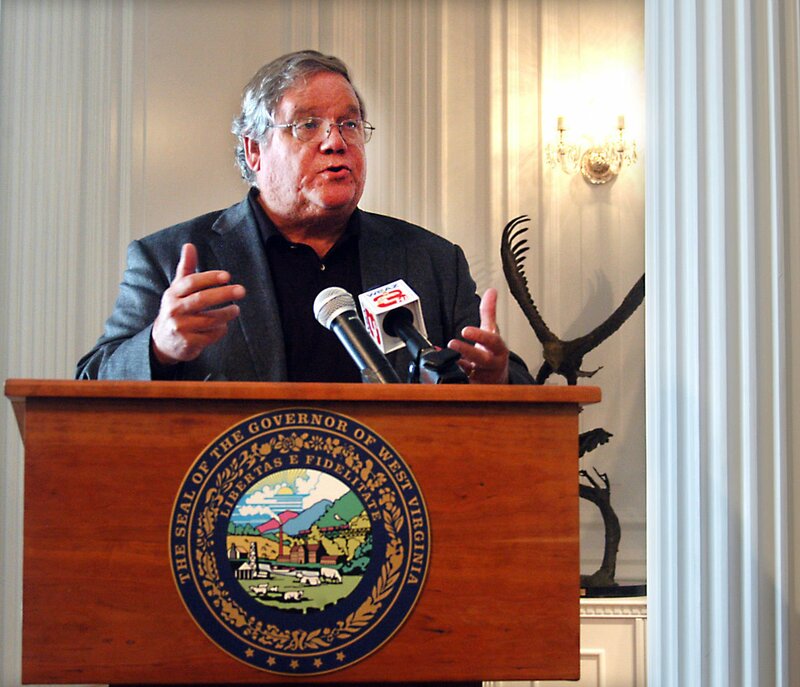 Jim Justice announced the barrel factory at a press conference in Charleston. At the time, then-state Commerce Secretary Woody Thrasher said the plant was expected to create 113 jobs, plus ancillary jobs for the timber industry. The barrel plant jobs would pay at least $40,000 a year, Thrasher said at the time. …Federal regulations require distillers to use white oak to make barrels for aging whiskey, Crabtree said in October. Distillers used charred barrels because the burnt interior of the barrels helps give whiskey its distinctive brown color. 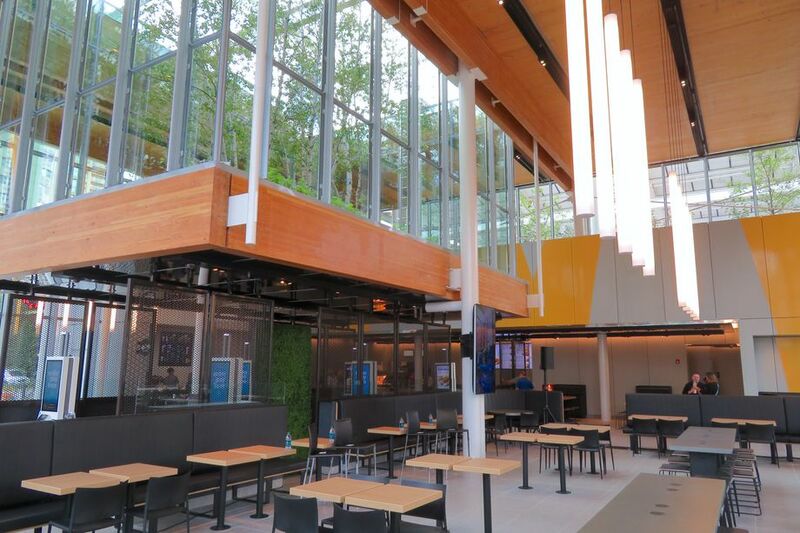 The futuristic makeover of Chicago’s infamous Rock ‘N’ Roll McDonald’s at the corner of Clark and Ontario streets will open its doors and welcome its first walk-in customers on Thursday, August 9. Taking just 13 months from design conceptualization to completion, the transformation ditches the kitschy Elvis and Beatles memorabilia of its predecessor for a sleek contemporary design with an emphasizes on technology and sustainability. The essentially all-new building (only the kitchen enclosure is carried over from the old store) comes from Chicago-based architect Carol Ross Barney. It is a steel, glass, and cross laminated timber structure topped by a canopy of solar panels. The latter is expected to cover 60 percent of the building’s electrical demands—which are roughly half that of its predecessor. Effective Saturday, Aug. 11, all areas of Island Timberlands (IT) private forest lands on Vancouver Island are closed to public access. All unauthorized access is prohibited, due to a high level of wildfire activity throughout the province, in combination with a forecast for ongoing hot and dry weather conditions, according to a release from IT. The majority of IT lands have been closed for access during the week, but weekend access will also be closed starting this Saturday. IT has responded to two wildfires on its landbase in the past two days. A three-hectare fire south of Turtle Lake is contained and crews are mopping up. A second wildfire, located west of Lacy Lake, is estimated at five hectares in size and is being aggressively actioned by ground and air crews. Both fires are suspected to be human-caused. The provincial government and the Southern Dakelh Nation Alliance signed a government-to-government agreement Friday, which lays a foundation for building positive a relationship based on respect and recognition of rights. …The Foundation Framework Agreement… commits the two governments to work collaboratively on decisions over land and resource management, increasing First Nations economic development and participation in the forest economy, improving consultation on resource development and developing cultures and wellness priorities. Doug Donaldson, Minister of Forests, Lands, Natural Resource Operations and Rural Development, says topics of mutual interest include wildfire prevention and response, timber supply review, and moose and caribou management. TORONTO – The Ontario government is adding $100 million to funds available to fight forest fires in the province. The Progressive Conservative government made the announcement on Wednesday and says the money is on top of base funding of almost $70 million to battle the blazes. Ontario’s Ministry of Natural Resources says there are 116 active fires, including 73 in the northwest region and 43 across the northeast. That compared to 120 active fires on Tuesday afternoon. 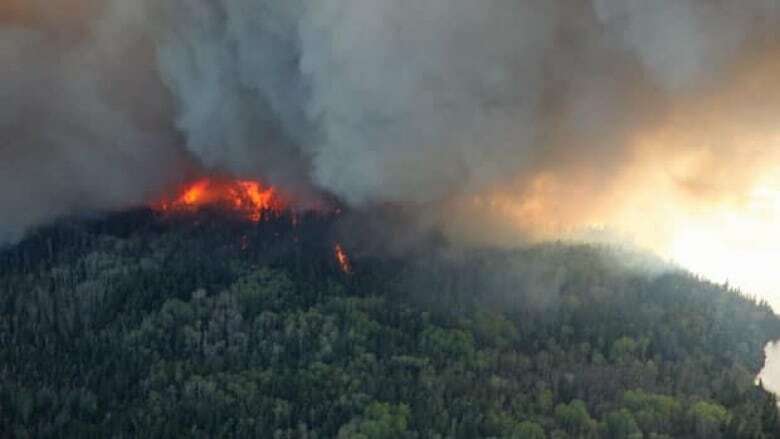 …Almost 1,000 firefighters from Ontario are being assisted by about 480 firefighters and support staff, as well as aircraft and other equipment, from other provinces, Parks Canada, American states and Mexico. The Philomath School District’s forestry and natural resources programs have earned a reputation over the years as being among the best in the state. Through the work of instructor Simon Babcock over the past 15 years and various forestry partners, those programs have become even more valuable to students. 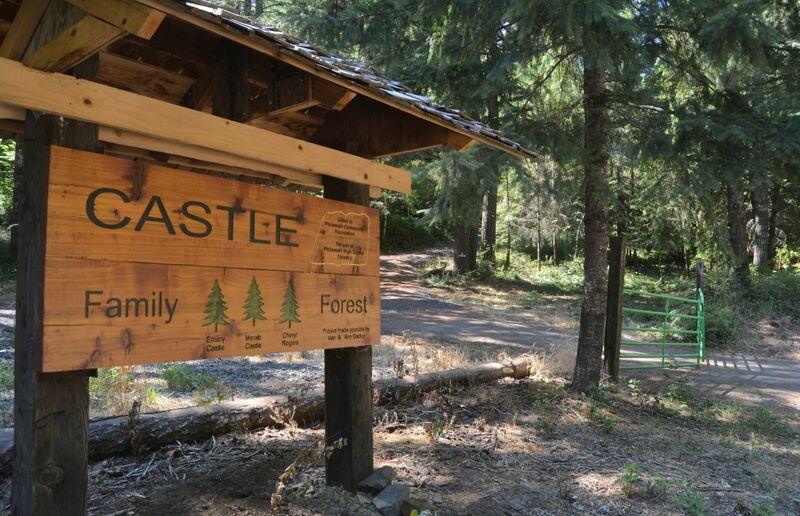 Then in 2016, Emery Castle and his daughter, Cheryl Rogers, donated 20 acres of working timberland to the Philomath Community Foundation to be used for environmental education purposes. Now, significant two-year grant funding through the Ford Family Foundation is expected to help those programs reach new heights. Being the best in Oregon isn’t the goal any longer. Now, it’s to be the best in the nation. …The district announced last month the creation of the “Philomath, Oregon Student Forestry Research Laboratory,” a step toward the significant expansion of forestry and natural resources programming. SALT LAKE CITY — …Republican Senate candidate Mitt Romney has called for more logging and a high-tech early detection system in a plan that was met with some skepticism. Romney… said that more logging would thin out forests and clear dead timber so fires have less fuel. “If the devastation of wildfires were being caused by a foreign enemy rather than by natural causes, we would do and spend whatever it took to stop it,” he wrote. U.S. Interior Secretary Ryan Zinke also advocated for thinning out forests… Zinke took aim at “radical environmentalists,” who oppose logging, but Romney said there could be common ground if stopping fires meant saving animals and habitat. …Romney said he also wants to beef up regional firefighter resources and create an early detection system of drones, satellites and sensors. …Fire experts said an early detection system isn’t at the top of their wish list. 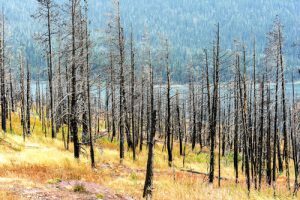 MISSOULA – A year after fires roared through Western Montana burning hundreds of thousands of acres, the US Forest Service says it will be salvaging more than 100 million board feet of marketable lumber. More than 250,000 acres burned in just the major fires in the Missoula region last year… USFS leaders say they’ll be salvaging over 14,000 acres of burned timber impacted by last year’s fire season. In figures released yesterday, that amounts to 116 million board feet spread across five different fire areas. The projects are made possible using an “Emergency Situation Determination”, which also allows for reforestation or nearly 24,000 acres and the removal of more than hazard trees on more than 300 miles of forest roads. Wales’ biggest quango has admitted a deal to sell wood to a sawmill without going to the open market lost taxpayers £1m, a report said. 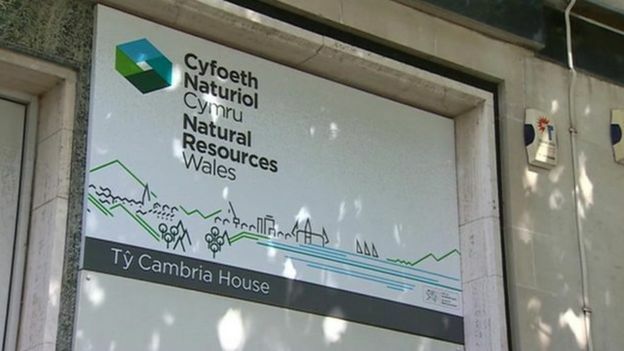 New details have been revealed on repeated failures by Natural Resources Wales to properly tender timber grown on publicly-owned woodland. Labour AM Lee Waters said taxpayers had been “ripped-off” by the debacle. NRW, which is holding an independent review into what happened, has said sorry for the sales. The Wales Audit Office report discloses some of what took place behind the scenes when a 10-year agreement with BSW Timber ended. … The deal, which was not tendered, was criticised by the former auditor general Huw Vaughan Thomas. Nevertheless, NRW awarded the company and subsidiary Tillhill further contracts without going to the open market. In both cases the auditor was unable to satisfy himself that the deals were lawful. The Nanaimo Lakes wildfire is still growing, but firefighters are getting a better handle on that growth. The fire southwest of the city grew to 179 hectares as of Wednesday evening, but it’s now considered 25 per cent contained, according to B.C. Wildfire Services. Donna MacPherson, with the Coastal Fire Centre, said the fire “held really well” on three sides during Wednesday’s firefighting. …“They’ve been focusing on the sides that could impact people the most … They’ve basically been able to get around on the west and the south and the east sides and now they’re trying to work toward the north. That’s the hard part because of the terrain.” …MacPherson said the message the fire centre really wants to get out is for members of the public to “smarten up,” as the Nanaimo fire and two fires that broke out in the Alberni Valley are all suspected to have been human-caused. It was late to start, but what British Columbia’s wildfire season has lacked in length it’s more than made up for in intensity. As of Wednesday, there were 460 wildfires burning across B.C., 25 of them large “fires of note,” according to the B.C. Wildfire Service; that’s more active fires than any single day of 2017’s record fire season. “All the way from the U.S. border right up to almost the border of the Panhandle with Alaska, we’ve got fires of note,” said B.C. Forests Minister Doug Donaldson. There have been 1,502 fires since April 1 that have burned about 101,000 hectares of land at a cost of $131 million. About 2,700 people are engaged in firefighting efforts across B.C., including more than 100 out-of-province wildfire personnel. More are expected in the coming days, including personnel from Quebec, where the fire situation has improved. PRINCE GEORGE – The Chutanli Lake fire southwest of Prince George exploded Tuesday to 1,500 hectares. On Wednesday, it grew to 1,800 hectares. Crews and equipment were forced to retreat as the fire jumped the Kluskus Forest Service Road. Wildfire BC officials say it’s being fueled by strong winds and hot, dry conditions. The Cariboo Regional District has issued an expanded evacuation alert around the blaze. …It is the same story for the Shovel Lake fire northwest of Fraser Lake. It burst through containment lines …growing from 5,400 hectares to more than 6,800 hectares. …Nearly 140 firefighters and support staff are battling the flames along with 14 helicopters and 51 pieces of heavy equipment. Meantime the Chief of the Tahltan First Nation says a wildfire has destroyed 27 structures in the Telegraph Creek area. Chief Rick McLean estimates the fire has ripped through 30 to 45 percent of buildings in the remote community southwest of Dease Lake. California is no stranger to fire. The temperate winters and reliably dry summers that make the Golden state such an attractive place to live are the same conditions that make this region among the most flammable places on Earth. But even for a region accustomed to fire, the continuing wildfire siege has proven unprecedented. Although it is only early August… intense fires have already burned vast swaths of land throughout the state… California already has the largest dedicated wildland firefighting agency in the country by far… But given the inevitability of wildfire, thousands of other vulnerable communities will need to follow this lead or face a repeat of tragedies on the scale experienced in Santa Rosa, Ventura, and Redding over the past year. In the era of megafires, our choice is clear: find new solutions or face even greater disasters. The largest wildfire in California’s history continues to grow. Hot and windy conditions have tested firefighters across the state. The Northern California fire by the Mendocino National Forest has now destroyed 1,178 square kilometers. That is nearly the size of Los Angeles. The Mendocino fire continued to grow this week, even after it passed a record set only eight months ago. Last December, the Thomas fire destroyed 1,139 square kilometers in Southern California. It killed two people and burned more than 1,000 buildings. The Mendocino fire is mostly burning in remote areas. But officials say it threatens more than 11,000 buildings. Over the weekend, officials ordered more people to leave their homes. The fast-moving Holy Fire is ripping its way through the Cleveland National Forest for a third straight day, taking down thousands of acres as high temperatures and low humidity plague the region. U.S. Forest Service officials said the Holy Fire, which erupted Monday afternoon near Holy Jim Canyon and Trabuco Creek roads in the Orange County area, has burned at least 6,200 acres and is 5 percent contained as of Wednesday afternoon. 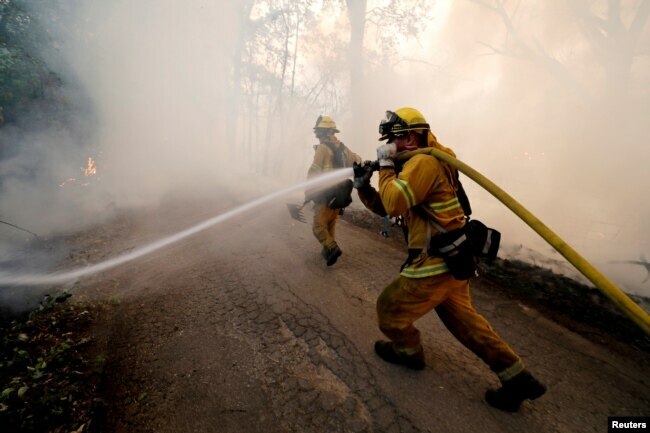 Officials said 383 firefighting personnel are assigned to battle the wildfire. Ten helicopters and seven fixed-wing aircraft are working to support ground personnel. …The lack of resources for direct attack will allow the fire to spread into new areas, and align for strong head-fire runs and the potential for an ‘Elsinore’ down slope event. …Authorities say 51-year-old Forrest Gordon Clark was arrested on suspicion of felony arson and other charges related to the Holy Fire investigation. CALIFORNIA — The nation’s most populous state and the world’s fifth-largest economy , is on fire. In a state already known for monster conflagrations, the past month has been unusually destructive. …As much as the president might prefer to point fingers elsewhere, it is impossible to talk about California’s blazes without considering the role of climate change. Four of the five largest conflagrations the state has had to battle have come since 2012 , according to the Los Angeles Times, and that is probably no mere coincidence. …Addressing global warming and hiring more firefighters are obvious responses; the federal government should also prepare to spend more money in disaster relief. Yet, pumping cash into ever-more firefighting is in part how forest fires got so bad in the West. So much of the U.S. Forest Service’s budget has gone to firefighting that too little has been left for care and restoration. Vancouver is famous for its beautiful summers. …Last year those mountains vanished. …Today, hundreds of fires are burning across the province — and indeed the continent — as heat records are being smashed around the globe. And though their smoke has yet to mar our coastline this year, that time will surely come again. As members of the Canadian Association of Physicians for the Environment, we are deeply concerned about the health consequences of increased forest fires due to climate change. …While no single forest fire can be attributed directly to climate change, shifting weather patterns and climate zones that parch wetlands and forests and expand the range of tree-killing pests, as well as increase the frequency of lightning strikes, are creating ideal conditions for ignition and fire spread. …It’s time to wake up and smell the smoke. NANAIMO — The province’s workplace safety authority confirmed a TimberWest employee was found dead in a vehicle south of Nanaimo about 10 p.m. on Monday. “The worker was not a firefighter. Early information indicates the worker was making a delivery to forest wildfire fighters,” said Trish Knight Chernecki, a WorkSafe B.C. spokeswoman. She said a WorkSafe investigator was sent to the scene. Knight Chernecki said the death was not related to a crash, but could not give further details, including the person’s name, age and gender. …Crews were battling a new fire at Maple Mountain in the Cowichan Valley on Wednesday. Some residents had to evacuate their homes. …It was the fourth fire — among 462 wildfires burning across B.C. — to break out on Vancouver Island in the past few days. Debbie Dobrosky noticed a peculiar hue in the sky on Monday — “a very ugly yellow casting” — as she peeked outside. A large cloud of smoke had begun to cover the sun. By Tuesday, the smoke was so heavy that “even inside my apartment I’ve had to use my inhaler twice this morning, which is not a normal thing,” said Dobrosky, a Riverside County, Calif., resident who lives about 30 miles from a fast-growing fire in the Cleveland National Forest. …At least 17 large fires are burning across California, destroying hundreds of thousands of acres, sending toxic pollutants into the air and contaminating water supplies. The air quality in certain areas — particularly near the massive Mendocino Complex Fire in the northern part of the state — is among the worst officials have ever seen.